WikiLeaks founder Julian Assange is seen in a police van after he was arrested by British police outside the Ecuadorian embassy in London, April 11, 2019. U.S. lawmakers on Thursday hailed the arrest of WikiLeaks founder Julian Assange in Britain and urged his prompt extradition to face charges in the United States. "It's about time," Republican Sen. John Cornyn of Texas told VOA. "I'm glad he'll finally get brought to justice." "Thank God," West Virginia Democratic Sen. Joe Manchin said. "This is needed, very much needed. I'm very thankful for our friends in the U.K."
Assange was taken into custody after Ecuador ended his extended asylum at the country's embassy in London. In the United States, he stands accused of taking part in a computer hacking conspiracy that led to a treasure trove of classified information divulged on WikiLeaks. The website also published a massive number of emails hacked from 2016 Democratic presidential candidate Hillary Clinton's campaign, a fact stressed by Democratic Sen. Richard Blumenthal of Connecticut. "He should be extradited and face justice here," Blumenthal said. "Justice should come to Julian Assange for his role in Russian meddling in our election, and the sooner the better." The U.S. Justice Department has charged Assange with conspiracy to illegally seize sensitive data from a U.S. government computer, calling the incident "one of the largest compromises of classified information in the history of the United States." The Australian-born WikiLeaks executive has cast himself as a whistleblower, a portrayal his attorney sought to underscore. "This precedent means that any journalist can be extradited for prosecution in the United States for having published truthful information about the United States," lawyer Jennifer Robinson told reporters in London. On Thursday, Ben Wizner, director of the American Civil Liberties Union, sided with Assange in a speech. 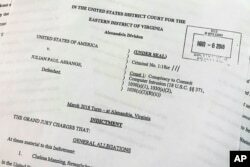 "While there is no First Amendment right to crack a government password, this indictment characterizes as part of a criminal conspiracy the routine and protected activities journalists often engage in as part of their daily jobs, such as encouraging a source to provide more information," he said. U.S. lawmakers rejected such assertions, noting Assange faces charges for tactics allegedly used to acquire material, not for the dissemination of it. "Stealing is still a crime. And conspiracy to steal is a crime, as well," Cornyn said. "I think in leaking he intended to do damage, because of who he was working with, or we assume he was working with," Manchin said. The West Virginia senator added that, unlike Assange, true whistleblowers try "to protect the people they work for and the institution." 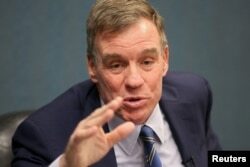 Sen. Mark Warner (D-VA) says he hopes that the British courts will quickly transfer Julian Assange to U.S. custody. "Julian Assange has long professed high ideals and moral superiority," the top Democrat on the Senate Intelligence Committee, Mark Warner of Virginia, said in a statement. "Unfortunately, whatever his intentions when he started WikiLeaks, what he's really become is a direct participant in Russian efforts to undermine the West and a dedicated accomplice in efforts to undermine American security." Warner added, "It is my hope that the British courts will quickly transfer him to U.S. custody so he can finally get the justice he deserves." Nebraska Republican Sen. Ben Sasse concurred. "Julian Assange has long been a wicked tool of Vladimir Putin and the Russian intelligence services," Sasse tweeted. "He deserves to spend the rest of his life in prison."